Kendall Audiology is an independent practice carrying hearing aids from all the major manufacturers. We take pride in offering a variety of hearing device styles to fit all of our patients’ unique needs. We offer devices that fit behind-the-ear to devices that are custom fit to your ear canal. All styles provide state-of-the-art sound quality while remaining comfortable and discreet. 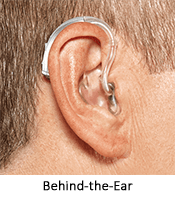 Hearing devices are advanced pieces of technology and come equipped with a range of features. Devices are usually water resistant. They can provide audio streaming from your television, smartphone, and other devices. You are even able to control your devices though your smartphone so you can make adjustments to give you the best listening experience based on your environment. How active are you socially? What types of events do you go to? Are you on the phone a lot? We'll find out where your biggest hearing difficulties are, then make recommendations based on what you really need. If you lead a quiet lifestyle, you may require different technology than someone who spends their time hiking or in many business meetings. You may want all the advanced features, such as Bluetooth connectivity, or your may not desire those features. It all depends on you. If you've worn hearing devices before, we'll ask you what you liked or didn't like about your previous hearing aids. Receiver-in-the-ear (RIC): Similar to the BTE, this sits behind the ear, but has a receiver that is inserted into the ear canal. 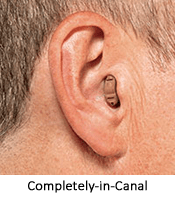 In-the-ear (ITE): This hearing aid sits on the outer portion of the inner ear. 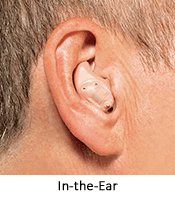 In-the-canal (ITC): This hearing aid is fitted and sits inside of the ear canal. Completely-in-the-canal (CIC): This is the smallest hearing device. It requires a custom fitting and is inserted deep into the ear canal. Of these styles, our most popular is the receiver-in-canal, which is discreet and has good quality of sound. But we have patients who prefer other models, such as the custom-fit CICs. We'll talk to you about the benefits of each model and find one that you like. The main cost differentiator among hearing aids is the level of technology you choose. Most manufacturers offer three or four technology levels, from simpler hearing aids to more advanced models. The biggest difference among these is how much background noise management is included in the hearing aid, so a lot depends on whether you spend your time in quiet environments or more demanding ones. We'll match our recommendations to your lifestyle needs. We never upsell; our patients trust us because we're honest about what we think will be best for them. 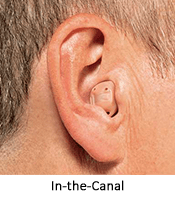 We've been really amazed by recent advancements in hearing aid technology. For example, bluetooth connectivity has taken off in many ways, allowing you to stream straight to your hearing aids from your television, your smartphone, or any other bluetooth-enabled device. We also appreciate the rechargeable hearing aids that have revolutionized the experience for many of our patients. It's much more convenient to charge your hearing aids overnight and know they'll be good to go the next day. 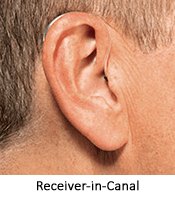 We work with all major hearing aid manufacturers including Oticon, Signia, ReSound, Starkey, Widex, and EarQ. The hearing aid market is always changing and product lines are always improving. 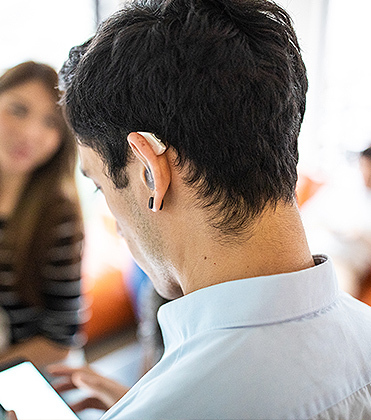 Manufacturers keep putting out new devices and technologies that change the world of hearing aids. Once we understand your hearing loss and what you need from a hearing aid, we'll recommend a brand and a model that we think will suit you. Each brand has its own strengths, such as smartphone streaming or an aesthetic look. We also work with Phonak, Bernafon, Sonic Innovations, Rexton, and Unitron. Since your hearing devices go with you everywhere, it’s only natural that they’ll experience some wear and tear. We recommend that you schedule routine service and cleaning on your hearing devices in order to keep them in great shape and allow you to get the most out of them. If something were to happen to your hearing devices, we are able to fully service all makes and models right in our office with short turnaround times. Some repairs can even be done on the same day so you won’t have to spend time without your hearing aids. If you have purchased hearing aids from someone else and are in need of service, we'll be happy to help you with cleaning and adjustments for a reasonable fee. We also work with Ear Service Corporation (ESCO) to ensure your devices are protected. To provide you more value and protection for your hearing aids, we offer the EarQ 4-year Secure Warranty. This guarantees your investment is safe with the longest warranty on hearing instruments available. 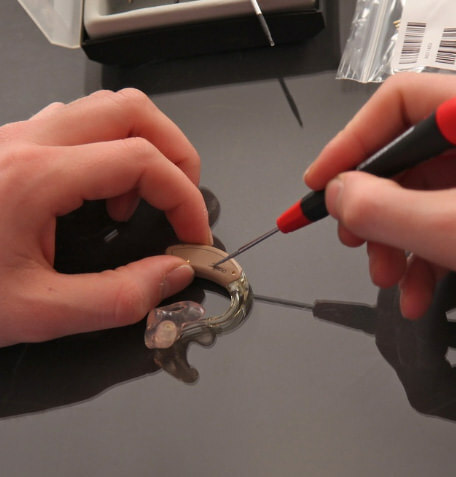 With the Secure Warranty, repairs on EarQ hearing devices are covered at no cost to you. You can have peace of mind knowing that the devices that provide you with an improved quality of life are secure. Hearing well is an investment you make in yourself and in your quality of living. At Kendall Audiology, we do everything we can to help you make this investment. Hearing aids come in different levels of technology available to meet different budgetary needs, and our office also offers 12-month no interest financing through CareCredit.